Short post, and then probably no post tomorrow night. And then none for a while as Jamie and I head out for San Francisco (don't tell anyone, but we hear there's gold out in Californie! GOLD!!!). So, remember when I was asking last week about where the Wolfman movie was? Ask and ye shall receive. Sounds like reshoots. Lots and lots of reshoots. Which... well, it explains why the things isn't here now. 1) Sounds like Rick Baker's company is involved. So... I'm sort of surprised that there's any creature design problems. 2) I kind of want to give Joe Johnston credit, because he was responsible for some movies I've enjoyed (Rocketeer, and, uhm...). But his stuff is also mostly painfully formulaic stuff. So... not exactly sure what went wrong, but if they want to make the creatures more awesome... The League can wait. I enjoy the original Wolfman movie. Its got its own brand of pathos that all good monster movies are really about. One day I need to spend some time overthinking the movie, and make postulations about how its really about race or the rise of fascism or some such. But its mostly just about a guy who becomes a werewolf-guy, and he really doesn't want to BE a werewolf guy (it totally screws with his love life). What to do while The League is Gone? I dunno. Go to Facebook and goof around on The League's Facebook page. Why not try out that whole "Discussions" tabs. Surely you people have something to talk about when I'm not here? Rumor has it that DC is giving away a Black Lantern ring as a promotional item this Wednesday. I'll be on a plane instead of grabbing my ring. Why did I agree to fly on a Wednesday again? Someone get The League a ring. Maybe if I say "Austin Books" here, Brad will get a Google alert and grab me a ring? Especially if I talk about what a great place Austin Books is and how much I enjoy their down home comicky hospitality and wide array of comics? And how you'd be a damn fool to buy your comics anywhere else? Well, a man's got to try. I've been wanting to watch The Right Stuff again lately. Not sure why. And then I turned around in someone's office at work today and they had a picture of Sam Shepard in their office. Apparently he gave a whole mess of his stuff to the UT Libraries. There's a "Right Stuff" display at the Benson Collection. Huh. Thanks to folks we spontaneously got together with this weekend. It was fun. I sort of thought I was going to be watching TV all weekend. I'm going to be posting pics to Facebook and stuff while we're gone. So keep up with me there, I think. I've got the damn Blackberry now, so e-mail me if you have a Superman emergency or whatnot. Apparently I was slightly off. Jon of "Jon & Kate" did not head to Tahiti with a stripper. He went to St. Tropez with Kate's plastic surgeon's daughter. Here. And, yes, the situation is a mess and I'm ashamed. Blah blah blah. But who called it? He left the confines of his marriage with a stentorian control freak for the nearest party girl. It’s so predictable and awful that I can’t help but feel an immense schadenfreude that makes me want to dance down the street and wave to strangers. See you in hell, everyone! Thanks to Randy for keeping me neck deep in my shame. Speaking of The Right Stuff there is a new book out called Rocket Men which talks about what it took to put the first men on the moon. I just listened to a half hour interview with the author, Craig Nelson, on my way into work. Sounds like a very interesting book. 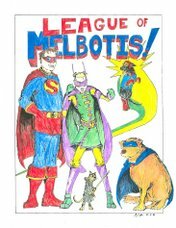 I see the spot where you can sign up to be a Fan of The League of Melbotis. Where does one sign up if they're interested in becoming an enemy of The League?